HEMPSTEAD, N.Y. – The Hofstra University men will look for their first victories of the season when they travel to Seton Hall Thursday night and open the home schedule Sunday afternoon (1 p.m.) against Harvard. The Pride (0-3-1) concludes a season-opening stretch of five games away from Hofstra Soccer Stadium Thursday at 6:30 p.m. at Owen T. Carroll Field. Seton Hall is 2-1. The series between the teams is tied at 2-2. 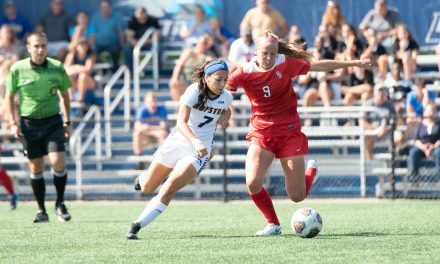 The last meeting came during the 2004 NCAA Division I Tournament when Hofstra upset the 21st-ranked Pirates, 2-1, for the Pride’s first-ever NCAA tourney win. Harvard is 1-1 this season as the Crimson play Thursday as well. Hofstra and Harvard have met just before with Harvard posting a 5-0 win in 1992 before a 0-0 tie during the 2016 season. Hofstra has been strong at home, posting a 3-1-3 record in 2017 and a 70-33-18 mark since 2003. In home openers under Coach Richard Nuttall, the Pride is 18-8-3. The Seton Hall match will be streamed on the Pirate Sports Network, while Pride Productions will stream Sunday’s home opener. An audio-only broadcast of Sunday’s match can be heard on 88.7 FM WRHU in Hempstead and the surrounding areas. Live statistics are also available for both matches. Video/audio and statistics can be accessed via the links on this page or on the men’s soccer schedule page on GoHofstra.com.